If you thought I was excited by seeing the walls and openings go up, you should have seen my gleeful dance upon climbing up the ladder into the playroom last night and seeing A GIANT HOLE IN THE BACK OF THE HOUSE WHERE THE BAY WINDOW USED TO BE. Boom! But first, the house had to be propped up. 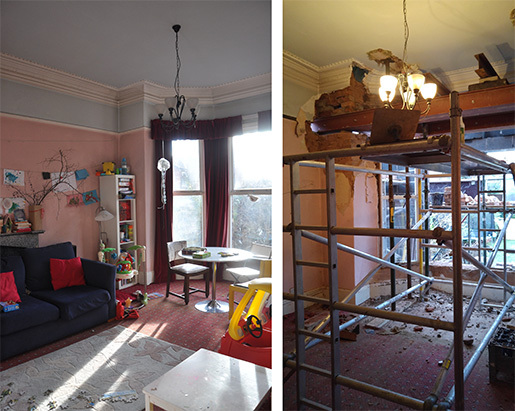 The builders did this by installing a number of temporary steel poles that braced against the ceiling in the playroom, the cellar below, and the hallway. Next, they bricked up a couple of parts of the house that will no longer have openings. 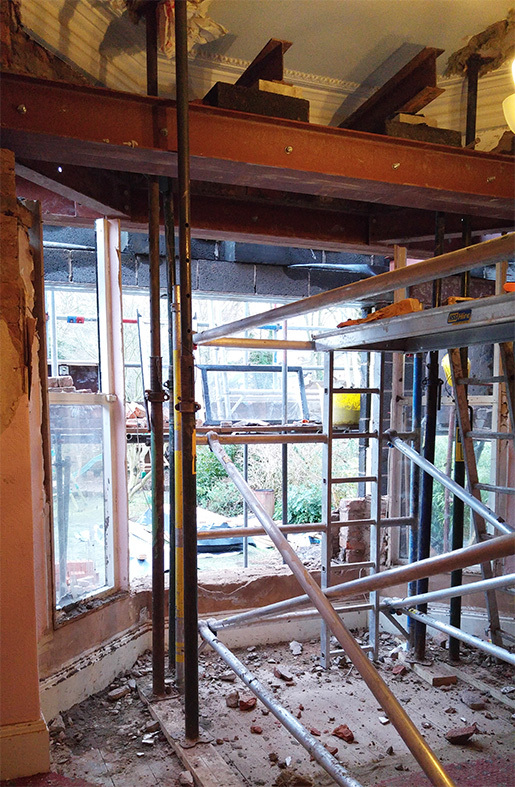 In the photo below, you can see the steel bracing pole on the right, the bricked up window towards the middle, and the stained glass window on the left that the builders removed. It's beautiful, but we needed the wall space in this part of the room more than we needed the window. Fortunately the builders were able to remove it intact with a bit of loving care, which means we can use it somewhere else in the house. The back door was taken out - and then swiftly rebuilt with engineered brick. It now includes a new porthole-type window that is at child height on the garden side of the wall and adult height on this side, thanks to the split-level floor. There will be two large panes of glass on the adjacent walls to let the light in - we added this little window just for fun. Next, the builders knocked meticulous holes in various parts of the wall to allow the steel to be threaded through and cemented into place. The picture below was taken while standing in the new extension. In the photo below you can see where the wall has been removed to allow for the steel, along with the steel props and a new concrete padstone. Yay, brickdust. We ended up a layer coating the entire house - the builders were only supposed to be working on the exterior walls but a brick from inside became slightly loose, resulting in plumes of red dust spiralling up the stair well. The steel was supposed to go in last week but it completely randomly snowed heavily for the day in Manchester, and dancing round on icy scaffolding wielding immensely heavy pieces of steel didn't seem like an outstanding plan, so the work was delayed until this week. 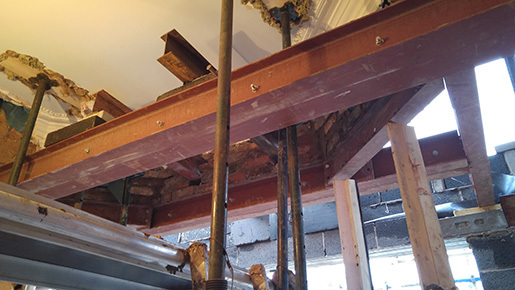 The steel in place supporting the bay window above (Eva's bedroom window). The view of the steel from inside the playroom. I fear the carpet will never be the same again. Note to self - do not let Natalia in here; she'll be straight up that platform. 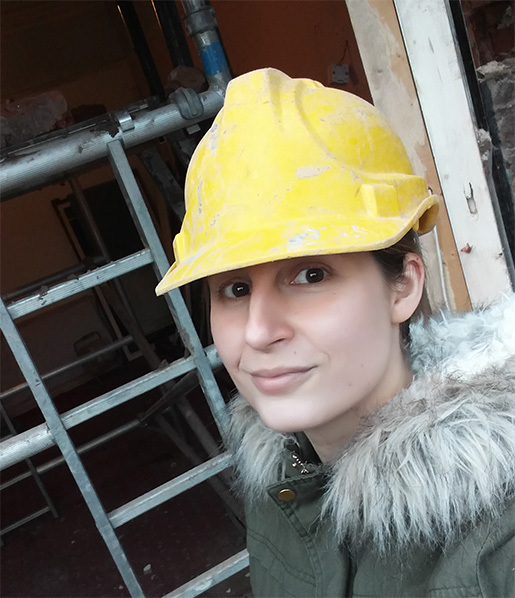 Idiot posing in a purloined hard hat. You can read the whole story of our extension from inspiration and planning to the current building work here.